​Artillery batteries, whether heavy or light, were composed of sections, each having two guns. Batteries were reduced to four guns each in December 1914 but returned to six guns each in March 1917. There were four batteries in each artillery brigade. Most batteries did not have war diaries; accounts of their activities were recorded in the diary of their brigade. Organized in June 1915 under the command of Major F. A. Peacock. Authorization published in General Order 103a of 15 August 1915. Recruited in the Hamilton district. Left Saint John 5 February 1916 aboard METAGAMA. Arrived in France 14 July 1916. 8th Brigade, 3rd Canadian Divisional Artillery: transferred to 9th Brigade in May 1917. Demobilized at Hamilton in March 1919. Disbanded by General Order 191 of 1 November 1920. Perpetuated by 31st (Vancouver) Field Battery. Organized as 165th (Canadian) Siege Battery at Horsham in June 1915 under the command of Major G. M. Maxwell. Formed from personnel of Canadian Siege Artillery Depot at Horsham, mainly from 97th, 131st, 98th and 107th Canadian Siege Batteries. Arrived in France 21 September 1916. Redesignated 5th Canadian Siege Battery on 29 January 1917. 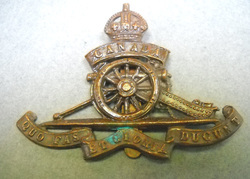 Attached to 1st Canadian Heavy Artillery Group, then, in January 1917, to 2nd Brigade, Canadian Garrison Artillery. Demobilized at Vancouver in May 1919. Perpetuated by 5th Medium Battery, Vancouver.